Last week, Music For Everyone hosted a music camp for 100 kids, including the very large kid in the picture above. I participated in the camp as a student/camper (part of the "Drum Warriors"). It was a blast! I learned a lot. Here are a few observations from walking a mile in the moccasins of a camper/student in music camp. It’s humbling (but in a very good way) being thrust into a situation where you have to rely on children to help you succeed. My three Drum Warrior bandmates’ ages ran from 9-11. They all knew how to read music while I have always struggled mightily in that department. They were very patient with me. As adults, we too often dismiss what children know and have to say. If we listen they can teach us a lot. And they clearly relish being in a position where they are teaching an adult as opposed to always being the student. I was also struck with just how amazing, competent and patient all of the instructors were (most of them full-time music teachers in schools). Whatever it is we pay our teachers, it is clearly NOT enough. Their ability to corral, organize, inspire, encourage young students (and a much older one) was truly impressive. I gained an even more powerful sense of, and appreciation for, their ability to lead and inspire a large group of kids when I was asked to step out of my role as a camper to act as a teacher for a few minutes one morning. During the camp, various ensembles of approximately 25 – 30 children were created to learn, rehearse and on the final day of camp, perform a few pieces of music. One of the teachers/directors of one of the ensembles was called out of the room to consult with another teacher about a piece of music. I was asked, as the only available adult, to cover for that teacher for a few minutes – just to have an adult in the room. But as I stepped into the room to face an ensemble of 25 kids ages 9 – 14, I realized that they all knew more than me about the music in front of them. Away they went, with me swinging my arms in time, mimicking what I observed the real teachers doing when they conducted the group. “Of course.” And just like that, a “posse” had been unleashed into the halls. One is no big deal. Two is manageable. But three is a small posse. Meanwhile, inside my classroom, things were rapidly deteriorating. Trying to think and improvise as a musician might, I asked them each to play their personal favorite note. They all complied, but by the end of this little exercise it was clear that the inmates had taken over the asylum. Fortunately, the real teacher re-entered the room to restore order. So, from the point of this camper, whatever it is we pay teachers, it is NOT enough. So we walked. Five of us, including Skippy Brask, her prize student. We quit the chorus. Our demonstration caused quite a stir in our small suburban elementary school. A group of eighth graders walking out on Ms. Haynes? Quitting over the Beatles? Maybe it wasn’t Woodstock , punk rock or Chuck Berry, but it was our own little rock ’n’ roll revolution. We drew a line in the sand at “Hey Jude.” We had no clue at the time, but we were using music’s transformational powers to make a statement to spur change. For 35 years or so, off and on, l sang and played the guitar for money. Semi professionally, l called it. I played solo gigs (gig is what musicians call them when they want to sound cool), and l played in duos, trios and bands. It was generally a fun time, performing in clubs, concerts and festivals. The money was not particularly good, if you added in the practice time, the broken strings and the instrument repairs. But l found great satisfaction in performing my original songs to an enthusiastic crowd. This is what is considered a good gig. But there were bad gigs too, the ones in which the club owner disappears when it's time to pay you, or when the bachelor party in the audience has decided to play spitball with their napkins or the ones in which the acoustics in the room are so terrible that you can not hear yourself sing. Ever try singing along with someone when neither of you can hear anything but feedback and crowd noise? And there were fistfights, cigarette smoke, arguments .... The list goes on and on. Recently l read about the sort of musical engagement that professionals like to call "the gig from hell". 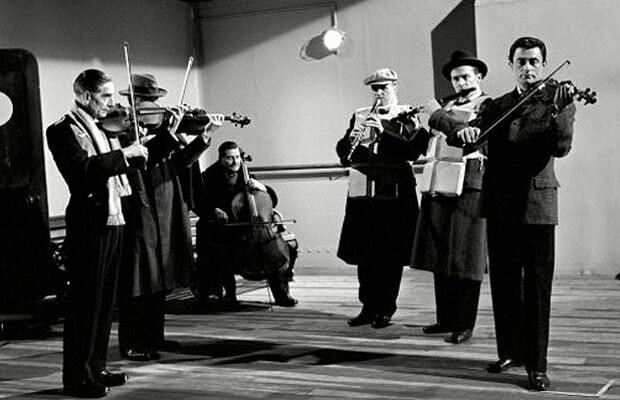 It was concerning the musicians who were hired to perform on the Titanic. Okay, so we all know how that ended, and it is true that none of the musicians could get seats in a lifeboat, and they all perished. If that wasn't degrading enough, they didn't get paid at the end of the night, a night for which they gave their life, and included moments of extreme pandemonium, wet feet, and having to play "Nearer my God to thee" to a rather oblivious audience. Drunks throwing spitballs were the least of their worries. The musicians had been quartered in second class, no surprise there, in cramped rooms next to the potato washer. There were actually two separate bands, who most likely didn't even know each others songs, but they chose to combine forces and "jam" in their last hours. I am not making this up. Realizing that as they were 2nd class passengers, they would never get a seat in a lifeboat and that the end was near, they took it upon themselves to comfort the remaining passengers with song. They played for several hours through the worst of conditions, on an uneven stage to a very distracted audience. Some survivors, seated in their lifeboats, recall hearing "light, cheerful music, ragtime, waltzes and comic songs" drifting across the water. These were heroes in every sense of the word. Minutes before the ship broke apart, the men bid each other farewell, and with great dignity, wandered off to meet their demise in their own personal way. Wallace Hartley, the bandmaster, slipped his violin into his valise, strapped it to his body, and together they faced the icy waters of the North Atlantic. A few weeks after the tragedy, the band was hailed the world over. These brave men, without a thought to their own safety, had brought hope and comfort to many others. Editorials, speeches, sermons and reams of worshipful poetry celebrated their deed, and letters of condolence poured into the homes of their families. So, the gig killed them. But they were immortalized, which is arguably better than crappy pay at the end of the night. To add insult to injury, two weeks after the tragedy, the families received letters from the agent who booked the band, asking to be reimbursed for the band uniforms. And while the band was idolized around the world, the owners of the Titanic, successfully fought the families' attempt to gain back pay. Some gigs nothing goes right. The body of Wallace Hartley, along with his violin, was retrieved from the icy waters off Newfoundland and brought home to Colne, his birthplace in the hills of Lancashire. Seven bands followed his casket in the funeral procession, as well as local dignitaries, and musicians from all over England. Thousands lined the route and all businesses closed for the day. This sort of ending doesn't happen when you play rock and roll in clubs, even on a bad night. You might end up with a sore throat from singing all night. And the drunks might stumble up, buy you a drink and tell you they know somebody in the "industry", someone who can help you out. But unless you spill your drink, your feet don't get wet...and you won't have to sleep next to the potato washer. My daughter handed me a large box. Then I heard the whisper from that dark spot deep in the back of my wounded psyche. I’d heard that whisper before. This wasn’t the first time I’d considered returning to vinyl. She had been doing vinyl for a few years. My son soon followed suit. Being only 21 and 19 at the time, it was their first foray into the world of record collecting. There have been unexpected benefits from them doing so. For example, selecting presents has become less stressful, more fun and infinitely more meaningful. When your children begin collecting albums, you want to be certain you help them get off to a good start. You provide the basics – the cornerstones – The Allman Brothers “Live at the Fillmore”, Hendrix “Are You Experienced?”, Miles Davis “Kind of Blue”, along with some Stones, Dead, Doors, Carlos Santana and Rickie Lee Jones. Fatherhood is about providing your children with the basics to give them a firm foundation from which they can create their own path forward. Vinyl records were projected to sell 40 million units in 2017. According to Deloitte, that represents a seventh consecutive year of double digit growth. Clearly my kids were not alone. I had been lead to believe that the crisp, clarity of digital music reproduction and music streaming services had relegated the vinyl album to the dustbin of recorded music. Apparently not. Why the migration of music lovers to vinyl? Some claim that the faint sizzling sound flowing from the speakers validates vinyl’s authenticity and back to the roots credentials. Others love the album covers, which are pieces of art with or without the music contained inside: the Andy Warhol “Banana Art” that graces the cover of the Velvet Underground’s debut album, The Stones’ “Sticky Fingers” and then there is the iconic 1972 Carly Simon “No Secrets” cover, which made a lasting impression on teenagers too numerous to mention. Others love the liner notes. Dissecting the lyrics can take on the feel of deciphering an ancient Buddhist Sanskrit tome in an attempt to discover the true meaning of Life. An age-old function of music and musicians has always been to tell stories about what’s going on around them in the culture of their time. The poetry of Dylan and Springsteen or the revolutionary calls of Bob Marley will be referenced and interpreted centuries from now by scholars intent on placing ancient events into historical context. And many simply reminisce regarding the practical utility of the two-panel album being the perfect tool to clean pot. There are no simple answers to what’s driving an increasing number of music lovers, young and old, to discovering or returning to vinyl. Perhaps it’s a reaction to a world that seems less personal, more disconnected and increasingly artificial. Maybe it’s a quiet call for a return to more authentic, ritualistic experiences. Or, in an age of automation, Artificial Intelligence and technological advancement, it could be a siren call for a simpler time. When people feel disconnected, real, authentic experiences assume more meaning and can be nourishing for a shaken soul. In such a world there is value in the act of holding an album and fully experiencing not only the sound but the texture, weight and feel of it. And there is a greater connection to the music in the physical act of having to change an album or to flip it over to experience Side Two. Or, in the case of Joe Jackson’s “Night and Day”, to flip from the “Day” side to the “Night” side. This, as opposed to punching a button to listen to a play list determined by a Pandora algorithm. Regardless, my daughter’s gift forced me to confront the musical demons residing in that dark spot in my psyche for what I did was shameful. Fifteen years ago, I gave away my 600 plus record collection. I have no excuses. I was told that in the digital age, the album had become obsolete. And I believed it. But I take full responsibility. Most disappointing was that I had been unfaithful. I didn’t trust the time tested beauty and authenticity of the vinyl album. With every new story of another music lover raving about their return to vinyl, I’d experience another moment of well-deserved depression. As children often do, my daughter taught me a lesson and did me a favor. She recognized that it was time for me to embrace albums again and intervened accordingly. And as is often the case, out of the rubble of pain and shame, comes a chance at rebirth. It’s often said that you have to hit rock bottom before taking your first step on the path to salvation. Fortunately, I had, without realizing it at the time, laid the groundwork for my personal musical redemption. I didn’t give all of them away. There were several that I simply couldn’t bear to part with, regardless of whether they would ever spin on a turntable again. Out of the ashes, there were remnants upon which to rebuild. Among the handful of survivors was Tom Wait’s “Nighthawks at the Diner”, Woodstock, the collection of Robert Johnson’s original songs, recorded in hotel rooms in Dallas in 1936 and San Antonio in 1937, Steely Dan’s “The Royal Scam”, Jethro Tull’s “Aqualung” and the Kansas City Blues Shouter, Big Joe Turner’s “Greatest Hits”, with a cover photo that perfectly depicts just how big Big Joe Turner was. I’d also kept a personally inscribed copy of Koko Taylor’s “From the Heart of a Woman”. “To Gerd: With Love, Koko Taylor”. Give away a love note from the Queen of the Blues? I may have been foolish in giving away over 600 albums, but I wasn’t delusional. Talk about a gold mine! Lot’s of Al Hurt to scratch my New Orleans jazz itch, a few choice slices of Herb Alpert and the Tijuana Brass for a Latin fix and some Benny Goodman Big Band recordings. Throw in a few choice tidbits like Jimmy Smith and Count Basie and the result is the making of a small, but solid foundation upon which to rebuild. It made me realize that maybe the “Old Man” was a bit more hip than I had imagined. The path from my daughter’s gift and instructions to the boxes of my Father’s old records made me appreciate something far more important than the warm sound of vinyl. While my Dad is long gone, he did what Fathers do. He provided me with some basic building blocks – a good foundation upon which I can recreate my own musical path forward. Despite having to once again experience the pain of the loss of a lifetime album collection, I am thankful to have been provided a wonderful opportunity to do the same for my children. My wife and l are on a road trip with our daughter, Marisha, coasting through Yellowstone Park in her beast of a car, a Chevy Tahoe with 210,000 miles on the odometer. She knows the park, where to stop and view the scenery, where to hike, which attractions to visit. She is a Montana now, talking like one, confident and bold, though she draws the line at wearing a trucker hat, part of the standard uniform. She wont be here too many months longer, l think, her wanderlust is kicking in, and she is tired of being mistreated by her employers. "The only people in Montana are millionaires and the people that serve them" she says. We cruise through the park, but after a couple of days of her herding us around, here and there, stopping at all her favorite haunts, l am exhausted. She is a Taurus, and l am being bulled about. My age is catching up with me. I had slept poorly the night before and l figure we are headed to our hotel for the night, just outside of the park. But just before we reach the park boundary, she pulls over and orders us to grab our swimsuits. No explanation and very few answers. I am about to put my foot down as if l were her child throwing a tantrum. But the other two already have their suits and are heading down a path. I follow dutifully. She hadnt led us wrong yet. We change clothes in a smelly rest room and continue along the path. I tiredly stumble along, not even sure what we are up to, but pretty sure it involves water. The path follows the glacier fed Gardner River and people are walking the opposite direction. After about a mile, we come to a strange and beautiful place. A large stream of boiling water pours out of a hole in the ground and tumbles down into the adjacent river. In that area, all along the bank of the river, sit people of all nationalities and ages enjoying the mix of the hot and cold waters. Across the small river, not 20 yards from this confluence, stands a majestic elk, contentedly munching grass. We join the others, about 25 or so in number, each of us finding that sweet spot in the water where neither the frigid nor the boiling hot would overwhelm. I breath deeply and look around. There are probably 8 or 10 nationalities sitting in the river, all in this common quest to find a bit of thermal nirvana. Plus, there is the elk. I listen to gurgling water and the chatter of the many languages. The world is right again and l am overwhelmed by the moment. Marisha has not led us wrong, and l am, once again, humbled by her wisdom. Most of my friends will tell you that my vehicle is a piece of crap, a junk heap on wheels. They would be correct. It is a paint van, a work truck, and it has endured its share of paint thinner spills and paint can lids that loosened and allowed their contents to seep onto the floor. In the back tools and drop cloths and paint trays are scattered everywhere. But this van starts every time, and up front, except for the odor, things are nearly normal. The most unique feature from my perspective as the driver, is the radio. The radio is always on, which isn't to say that it is always playing. It plays intermittently, the wiring behind the dials has a mind of its own and it will decide when there shall be music and when there will be none. Bumps in the road are game changers, l might be singing along with an old Motown hit when a small pothole will thrust me into silence for the rest of the ride. Conversely, it can bring it back, out of nowhere, for 30 seconds or for a half hour. Here is Neil Young for a glorious minute.....or here is some much needed quiet. Of course, it wasn't always this way, there was a time when that radio played all the time, you know, like its supposed to. But as the situation worsened, l decided to see it, not as a nuisance, but as yes, yet another metaphor for life. Of course we don't always get what we want! Powerful and mysterious forces control our entire lives. Our favorite things get taken away quite suddenly and for no apparent reason. Other times, a beautiful experience comes out of nowhere, changes our life and then disappears with a bump in the road. As in the way of the cherry blossom, sometimes the beauty doesn't last long. Sure, l could have that radio fixed, but no way, that would cost more than the van is worth, and l'm learning way too much from that thing. My answer would be immediate and very clear. “I’d like to spend it on “Planet Dune”. Recently, I was able to spend a week there. While that was wonderful enough, there is only one thing better and that is extending your stay for two extra days due to a major snowstorm that resulted in the cancellation of hundreds of flights into the Northeast US. Planet Dune is on the Caribbean island of Anguilla. We have been traveling to Anguilla for about 15 years and this year I was on the island to take in and perform with my daughter at MoonSplash, one of the Caribbean’s fonkiest music festivals. The festival, which celebrated its 27th anniversary, is the brainchild of Bankie Banx, one of the Caribbean’s foremost musicians and songwriters. Bankie has performed all over the world for over 40 years. His lyrics, which touch a lot on social commentary and activism about the environment, economic justice, political corruption and civil rights has remained relevant for decades and his playing style and sound is very unique. If you had to describe his music it would be a cross between Bob Marley and Bob Dylan. The Dune Preserve is a plot of preserved land directly on the beach overlooking Rendezvous Bay with the island of St. Maarten visible in the distance. The warm, healing waters of the ocean lap at the foot of the Preserve itself, which proceeds up a sloping dune with a lush green hue provided by palm trees, sea grapes and other native Anguillan plants and fauna. For the past 25 years, Banx has, amongst those trees and greenery, been slowly building, much of it with his own hands, the Dune’s infrastructure to include a full kitchen, several bar areas and various nooks and crannies with tables and three distinct performance areas including a full sized stage made from the hull of a large sailboat. Think of a giant, meandering, tree house for adults perched above the shimmering blue-hued bay and amongst the swaying palm trees palm trees fed by the warm Caribbean breezes. The place is otherworldly. Pure Paradise. There’s no better place to be “stuck in”. And while the surroundings, scenery and vibe are about as cool as it gets, it’s the cast of characters that inhabit it and the visitors from all over the world who come to soak in the spirit and healing properties of Planet Dune that make it one of the fonkiest, hippest, coolest places on the planet. Some may call the regular cast of characters who inhabit the Dune “sketchy”, others simply “colorful”. Regardless, they are undeniably interesting, unique and entertaining. From Bullet, Bankie’s oldest friend and general right hand man, dreadlocks from head down to the tops of his, multi-colored Chuck Taylor Converse, old-school canvass high-top sneakers to “Choo-Choo”, a dead ringer for a Caribbean Buddha, stationed, perhaps permanently, on a wobbly bar stool, that without his Buddhist Karma, would otherwise have collapsed months ago. From Johnny Danger, a transplant from New Mexico who serves as the “supply procurement officer” and driver of the Winnebago on Bankie’s US tours to a bass player whose other lines of work you can only imagine for a New Yorker with the name Johnny Cement. There is the young bartender, Javier, who insists on you pronouncing it “JAH-vier”, given his Rasta beliefs and Peaches, the wonderfully delightful Mother Hen of Planet Dune to the Dune’s resident taxi driver, the dignified Philmore Lake. And the extremes of “Sunshine”, clearly Caribbean “royalty’ from the island of Nieves, decked out from fedora topped head to his slippered toes in full out white linen, a steady line of locals approaching to shake his hand and pay appropriate respects to the whippet like, deeply dark skinned and impossibly red-eyed “Homegrown”, best described as the Dune’s Doctor of “island attitude enhancement”. Hollywood couldn’t put together a more fonky, crazy, interesting cast of characters. Then there are the tourists, wanderers, nomads and mystics from across the globe – folks of all shapes, sizes, colors, and occupations who offer a steady stream of interesting conversations and entertaining moments as they embrace the freedom, anonymity and healing vibes of landing on Planet Dune for a spell of escapism. All to the constant soundtrack of Bankie Banx, Bob Marley and on rare occasions, even Willie Marble. One final afternoon on Earth? Put me on that solar ship to Planet Dune. Get ready - this one is going to rock ya.